102 children have died since the recall of corded blinds in 2000. According to Parents for Window Blind Safety (PWBS), a child dies every two weeks from strangulation due to corded window treatments. PWBS recommends all corded blinds be removed from homes, child daycare and military facilities, which is why Blinds Chalet is introducing Ultimate Cordless ¾” Single Cell Shades. which is why we are also offering 30% off on orders throughout January to make them affordable. 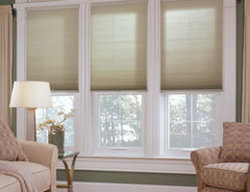 The Ultimate http://www.blindschalet.com/ultracellshades.html cordless cellular shades] are made with a newly designed lift mechanism making them easier to lift and much more versatile than the traditional cordless cellular shades. They also come with a PVC head rail and bottom rail and are engineered to hide brackets and increase light control. The cordless mechanism is located in the bottom rail for easier operation. Blinds Chalet also offers a three day turnaround time for in stock items to help business and homeowners eliminate unnecessary risks for children. “We take children’s safety seriously,” says Chris Stanley of Blinds Chalet, “which is why we are also offering 30% off on orders throughout January to make them affordable." For more information on Blinds Chalet or current trends in the industry contact Chris Stanley at info (at) blindschalet (dot) com or by phone at: 1-888-633-7840 or 480-633-7840. Or visit Blinds Chalet online at http://www.blindschalet.com.